Finding cheap flights and hotels becomes easier than ever with the HappyEasyGo app. Now, search for international and domestic flight tickets, compare fares for different airlines and make bookings on the go by simply downloading this application on your smartphone. Also, get an array of luxury and budget hotels at your fingertips. By installing the HappyEasyGo app, you open up an entire world of exclusive online hotel booking and flight booking offers and deals that help you make bigger savings on your reservations. - Whether planning to travel within India or fly abroad, book flight tickets and hotels in a jiffy. - You can book a seat with a domestic airline such as IndiGo, Jet Airways, GoAir, Air India and Vistara or an international one like Singapore Airlines, Etihad Airways, Emirates, British Airways, Qatar Airways, Lufthansa and Delta. - You can also choose from 1-star, 2-star, 3-star, 4-star and 5-star hotels, lodges and resorts across India. - Choose from thousands of hotels across hundreds of Indian cities and enjoy a delightful stay. 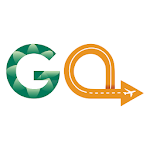 - Grab cheap flight and hotel booking deals and discounts exclusively available for HappyEasyGo app users. 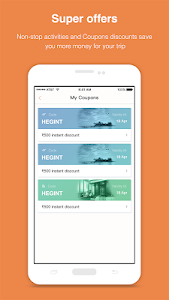 - Use exclusive flight and hotel coupons for app to save extra. - When booking through HappyEasyGo, you are guaranteed to find the lowest prices for flights and hotels. HappyEasyGo guarantees you the lowest airfares in India. Find an OTA offering cheaper flight tickets and get 200% of the fare difference. - We have the best deals on accommodation so you do not have to scroll through multiple websites. 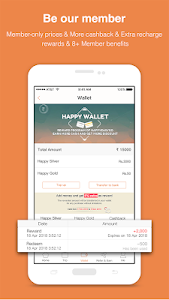 - You can pay for your flight tickets and hotel rooms using Happy Silver, Happy Gold or debit/credit card using the app itself. - Conveniently transfer the Happy Gold to your bank account when needed. - You can get loads cashback. 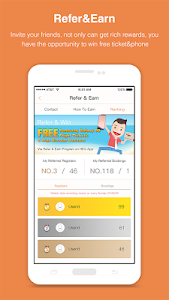 - Download the app and sign up right away and get instant 1000 Happy Silver bonus in your Happy Wallet. You can also start referring from the get-go and earn loads of Happy Silver and Happy Gold with every referral sign up and order. Planning a trip? Search for cheap hotels and flights now. 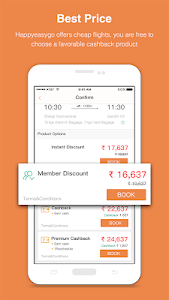 Similar to "HappyEasyGo - Cheap Flight & Hotel Booking App"